The government introduced the Good Samaritan Drug Overdose Act in May 2017 to provide some amnesty for drug users - but a year after the legislation was passed, many people are still too scared to call for help because they fear arrest. As her friend was overdosing on drugs laced with fentanyl, Katrina Adams called 911 in a panic. While paramedics were working to save the woman's life, police walked through the back door and began arresting other people in the house on drug charges. "A friend is overdosing and they're concerned with what they're overdosing on, but only to follow up with, 'Well, where did they get it?'" said Adams, a drug user living in Ottawa. In May 2017, the government introduced the Good Samaritan Drug Overdose Act — a law meant to prevent scenes like the one Adams witnessed last summer. A year after the legislation was passed, however, many drug users are still too scared to call for help in overdose crises because of the threat of arrest. The act provides a degree of amnesty for people who overdose, or who contact 911 to report an overdose. It protects those who report an overdose — and everyone else at the scene when police and paramedics arrive — from charges stemming from drug possession and breach of conditions, like parole or probation, related to possession. It doesn't shield anyone from charges related to outstanding warrants, drug production or trafficking. The Liberal government billed the legislation as a life-saving measure. Jane Philpott, who was health minister when the law was introduced, issued a public plea for people to call 911 to report overdoses — and promised they'd be safe from arrest if they did. "No one associated with that, the victim or the person who makes the phone call, will be at risk of being charged with possession of drugs," Philpott said at the time. "This is absolutely essential to save lives." Last year, almost 4,000 Canadians died of drug overdoses. The vast majority of those deaths can be traced back to one substance: the opioid ​fentanyl. The powerful painkiller is up to 50 times more potent than heroin, and a dose the size of a grain of sand can be enough to trigger an overdose. Experts CBC News spoke to said drug users have told them they wouldn't feel safe calling 911 to report an overdose — even if their own lives were on the line. Police aren't supposed to lay charges for drug possession at overdose events, but the experts say it's still happening often enough to make it hard to convince people to ask for help. "It's not like it's training where we're teaching someone how to do something. It's a change in process," said Scott Baptist, a superintendent with Toronto Police Service. "This is unique in that it's not a training piece. It's an awareness piece." The federal government didn't provide any funding or directives for training police to work with the Good Samaritan Drug Overdose Act. Instead, each police service was tasked with deciding if and how to educate their officers on the new law. No training protocol exists between Ottawa and police chiefs to cover new legislation, according to the Canadian Association of Chiefs of Police. "I think that we're more informed about [the law] than the police themselves," Adams said, adding she has little confidence in the ability of police officers to act in accordance with the Good Samaritan Drug Overdose Act. Even if police interpret and apply the law correctly, they still find themselves in situations where people don't trust them. "Drug users are very much afraid of being arrested, harassed, brutalized by police and [it] still remains a huge obstacle for calling 911," said Zoe Dodd, a harm reduction worker in Toronto. "The Act does not protect people from being questioned [about] where they got their drugs, or from police harassment." Drug-related crime in Canada is trending downwards, according to data from Statistics Canada. Almost 75 per cent of drug charges last year were laid for possession — something those reporting overdoses are supposed to be protected from under the Act. Ottawa-based criminal lawyer Michael Spratt said the reflexive response of the justice system is still to prosecute petty drug crimes. "Arresting someone … doesn't cure addiction," he said. "If it were only that easy, we wouldn't have an addiction crisis right now." A survey commissioned by the federal government last year found that most members of the general public they interviewed said they would be willing to call 911 in the event of an opioid overdose. 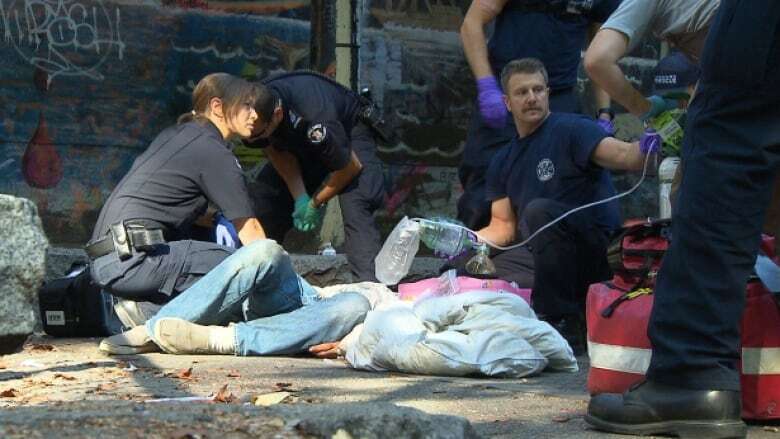 Emergency responders in Vancouver, Toronto and Ottawa say they haven't seen a noticeable increase in 911 calls for overdoses since the act was passed. But despite the criticisms of the legislation, many experts say it was still a step in the right direction. Marie-Eve Sylvestre, a law professor and addictions researcher at the University of Ottawa, commended the government for being willing to open up a dialogue on drug use. "I think all these things coming together is a sign that things are starting to change," she said. "But it has to be supported by, I think, much stronger harm reduction policies." Spratt agreed, saying the legislation's benefits are twofold: it shows the government acknowledges there is an addiction crisis and it gives individuals new tools to get help. Federal Health Minister Ginette Petitpas Taylor said the law didn't signal the end of the government's efforts to stem the overdose crisis. "That alone is not going to turn the tide," she told CBC Radio's The House. The minister said she's spoken to Public Safety Minister Ralph Goodale and Justice Minister Jody Wilson-Raybould about how to tackle overdose deaths. "We have to do all that we can to make sure people will call for help when needed," she said, leaving the door open to possible amendments to the legislation. "If more work needs to be done, we can certainly look at that as well." The government's 2018 budget set aside $230 million over five years to focus on targeted aspects of the overdose problem. The money has been set aside to improve access to treatment services, address the stigma around drug use, support law enforcement and border control and fund opioid-related research. The sum includes almost $6 million to provide increased training for law enforcement on harm reduction. But harm reduction workers in Canada's largest cities say police need to do more to address the fact that drug users don't trust them — not even when their lives are at risk. Academics and workers on the streets say municipalities should instruct police to stop attending overdose calls unless there's a safety threat. "This law has gone somewhat far, but we don't feel it's gone nearly far enough to protect those people who are overdosing and need help," said Sean LeBlanc, the chairperson of the Drug Users Advocacy League. Both Sylvestre and Alberta opioid researcher Elaine Hyshka said the scope of the legislation also needs to be widened to offer more protection and decriminalize other minor drug crimes. "If we want people to call 911 and feel safe calling 911 and calling for help, we need to stop criminalizing people who are using substances," Hyshka said. "Until we do that, I think we're going to continue to see people being afraid to call 911." The federal government has said it's not interested in decriminalizing any drugs other than cannabis, despite calls from the cities of Toronto and Montreal to consider the idea. Spratt suggested a stopgap fix that wouldn't require an amendment: raising police and public awareness of citizens' rights under the law. "We need to make sure that police officers are informed about this law, we need to make sure members of the public are informed." Since that night last summer, Adams said she has seen dozens more overdoses — and has come close to dying herself. She said she doesn't panic anymore: she knows how to administer naloxone, the opioid blocker used to treat overdoses. And the overdose itself scares her less, she said, than the thought that drug users might have to choose between dying and the prospect of arrest. "This isn't about it being a free pass for addicts or a get out of jail free card. Lives are being saved," she said. "That should be what matters."